Two tranquil meadows, plenty of large sequoia, a pretty stream and a historic cabin occupying a hollow tree trunk are the highlights of the mostly level, 2 mile loop hike around Crescent Meadow and Log Meadow, accessed by a side road in the Giant Forest area of Sequoia National Park. There are six meadows in this part of the forest, creating green and sunny interludes in the sometimes rather monotonous dark woodland, but these two are the easiest to reach, and although the first part of the hike (to Crescent Meadow) may be quite busy, not so many people continue to Log Meadow. Various other paths intersect allowing a variety of longer loop hikes to places deeper in the forest that receive even fewer visitors. Both meadows are likely places to spot deer, black bears and other mountain wildlife. 10 views of Crescent Meadow and Log Meadow. The narrow Crescent Meadow Road leaves the Generals Highway at Giant Forest Village, passes the Moro Rock turning after one mile then reaches Tunnel Log, where cars under 8 feet in height can drive through an opening in the trunk of a large sequoia that toppled over in 1937. Taller vehicles use a bypass route to one side. The road ends at a sizeable parking area, usually rather busy since along with Wolverton a few miles north, Crescent Meadow is one of the two main start points for backpacking trips into the Sierra Nevada (via the High Sierra Trail). Besides this, and the Crescent Meadow loop, one other path begins here; the 1.4 mile Sugar Pine Trail which heads southwest staying close to the edge of the Giant Forest plateau towards Moro Rock. 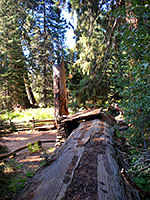 The loop trail first crosses a short patch of lush woodland to a signposted viewpoint at the south end of Crescent Meadow - John Muir's 'Gem of the Sierras', which presents a classic forest scene of verdant green grass sprinkled with wildflowers and enclosed by tall trees, including many super size sequoia, accompanied by a few dozen fallen trunks lying around the edge. The path forks soon after; one branch continues all along the east rim of the meadow and returns down the far side for a 1.2 mile round trip, while the right branch leads to the less visited Log Meadow. The Log Meadow Trail runs alongside Crescent Creek, a small but pretty stream edged by more huge sequoia and flowing through several pools that create nice reflections of the nearby trees. The meadow soon comes into view, similar in size and appearance to Crescent and also bordered by several large downed sequoias along the edges. The next part of the path climbs slightly up a fern-covered hill then drops back down the far side to the meadow, joining it next to another recently fallen tree, its 15 foot thick trunk fractured in several places due to the force of the impact. 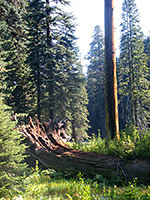 Sequoia wood is naturally brittle, so early loggers had to construct cushioning beds of thin branches, to preserve the trees intact when they were felled. 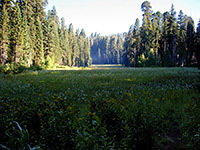 The trail follows the meadow northwards, past a junction with a connecting path to the Trail of the Sequoias, crosses the two upper forks of Crescent Creek and turns west, along the top of the meadow and to Tharps Log. This unusual structure is a cabin made by pioneer woodsman Hale Tharp who lived here for nearly 30 years until the creation of Sequoia National Park in 1890. The 50-foot long hollow trunk forms the main part of the cabin, plus a doorway with staircase at one end, and a plank-built room at the other, complete with stone fireplace and chimney. Tharp's wooden bed and table are still here today. The top of the log is a good place to stand for views of the meadow, where Tharp kept livestock and grew crops. The path splits just before the log, and again both branches return to the trailhead. The left trail follows the west side of Log Meadow, crosses a wooded hill and arrives back at Crescent Meadow after half a mile. The right fork heads westwards through bright, open forest to the Chimney Tree, an aged sequoia destroyed by fire in 1914 leaving a hollow blackened trunk, still standing defiantly. The next junction is with the Crescent Meadow loop, from where walking in either direction will return to the trailhead after 0.6 miles.